Big Blooms and Plenty of Them! When searching for an accent plant with vigor, style and a substantial size, look no further than this giant mum! During the last weeks of summer, when the seasonal perennials are fading from the garden, Pink Daisy is just getting started, producing plenty of pretty, deep pink flowers with sunny yellow eyes. The blooms are daisylike in form and grow to 3-4" wide. The lovely flowers, which fade to a lighter pink hue as they age, make a fine contrast to the russet tones of fall. 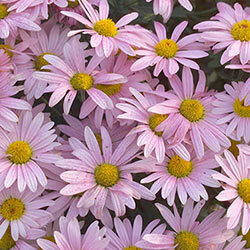 Place Pink Daisy near an entryway, along a walkway or even in a decorative container that can be moved around the property. 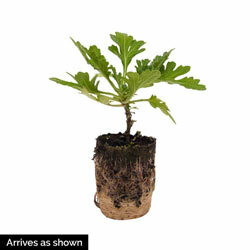 They are very hardy and grow to 3½' tall and up to 5' wide by their third year. Plant in well-drained, humus-rich soil for best results. Foliage Type: Aromatic, alternate deeply lobed, dark green leaves, gray underneath. Planting Instructions: Provide adequate spacing to get the full effect of the ball-shaped appearance. Requires ample moisture during growing season. Mums grown under moisture stress do not achieve the desired size. Set in ground at same level as growing in the pot. Pruning: Minimal care: no pinching, pruning or deadheading. Winter Care: Mulch in late fall to prevent frost heave as winter weather freezes then thaws. Additional Information: Most varieties benefit from being divided every 3-4 years or when their flower production drops.